Saturday, October 11, 2008 -- Whitehall is a place known for its historic residents. Philip Skene established the settlement, once called Skenesborough, in 1759. In 1776, Benedict Arnold (yes, that Benedict Arnold) built a fleet there, making it the birthplace of the American Navy. And then there's Bigfoot. Through the years, the Whitehall area has become a hotbed for alleged sightings of the giant, hairy creature. 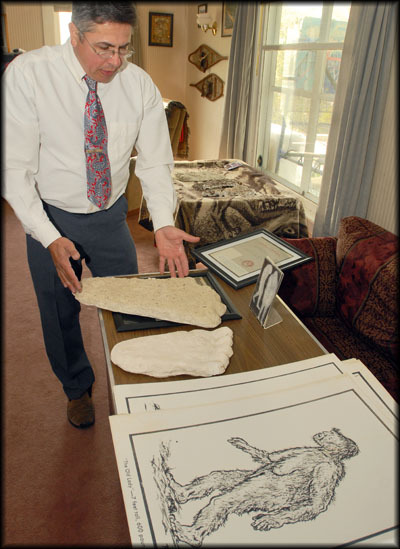 "We can trace it back to the Algonquin and the Iroquois," said Paul Bartholomew, co-author of "Bigfoot: Encounters in New York & New England: Documented Evidence, Stranger than Fiction." The recently released book by Bartholomew and his brother, Robert Bartholomew, chronicles hundreds of alleged eyewitness accounts across the region. From ancient American Indian lore up to events as recent as 2006, the stories show the prevalence of reports of the "monster" in the area. times there's a skunk-like smell. Bartholomew takes the reports seriously. "The witnesses have everything to lose and nothing to gain by putting the stories out there," he said. Bartholomew said he and his brother wrote "Bigfoot: Encounters in New York & New England" to document the prevalence of sightings in the region. Although reports of the creatures come from across the country and the world, Bigfoot -- or Sasquatch -- often is thought of as an entity of the Pacific Northwest. But claims of unusual creatures caught by surprise in the Adirondacks and the surrounding areas date back hundreds of years. "There's a real rich history on the East Coast that is often overlooked," Bartholomew said. "You look into the history of the area, and they were talking about this 100 and 200 years ago." For Whitehall, the pivotal year for sightings seems to be 1976. The country was celebrating its bicentennial, but Bigfoot was the local center of attention that summer and fall. Bartholomew details the encounters in his book. On Aug. 24, three Whitehall teens reported seeing a 7-to-8-foot-tall brown, hairy creature in a field off Abair Road. The teens allegedly saw the figure two times that night. They also claimed to hear a noise that sounded like a "cross between a woman screaming and a pig squealing." The next day, a farmer found "big, human footprints" nearby and a ravaged deer carcass. That night, a local off-duty police officer, who was a brother of one of the teens, went to the site with a New York State Trooper. Around midnight, the police officer spotted a pair of red eyes reflecting off his headlights. He shut off his lights and radioed the trooper, who put a spotlight on some nearby bushes. The police officer said he turned his headlights back on when he heard something crashing through the shrubs. He claims to have seen an almost 8-foot-tall creature that he estimated weighed 400 pounds. He didn't fire his gun because he said the figure looked too human. The creature then vanished into the bushes. Later that year, a village police sergeant reported hearing an "eerie, high-pitched yell" while hunting in the same area. A few days later, a man from Granville reported shooting at "Bigfoot." "It was a huge deal," Bartholomew, who was 12 at the time, remembered. "The town was really split down the middle." Through the years, Bartholomew has spent much of his free time talking to hundreds of people who have reported sightings. At his home in Whitehall, he has giant plaster casts that have been made from footprints at the scenes of some of the encounters. Finding a footprint on local terrain can be tricky, Bartholomew said. Tracks are most likely to appear along creek and river beds. Of the samples Bartholomew has examined, the author finds matching patterns in some footprints collected from sites around the world. "The dermal ridges are similar to castings made in the 1970s," he said, holding a casting taken in Vermont. The similarities make it unlikely the prints are hoaxes, according to Bartholomew. But not everyone is as convinced by the evidence. Naysayers often use bears as a likely explanation for the sightings and encounters. Bartholomew disagrees with that theory. Many of the reports compiled by Bartholomew involve drivers who claim to see a creature cross the road in a secluded area. Although the incidents usually happen at night, Bartholomew said the stories describe characteristics that don't match bears. The creatures almost always are described as walking on two legs, with a muscular structure similar to that of a human. Bartholomew said he never has seen a Bigfoot, but he has had some late-night roadway encounters with wildlife. "I hit a deer last night. I hit a couple a year," he said. The accident happened quickly, but he said he was able to identify the animal despite his surprise. "When skeptics say they are seeing bears, it doesn't seem plausible," he said. The personal accounts and collected evidence have convinced Bartholomew that a yet-undiscovered species is lurking in the woods around Whitehall. "I believe that something is being sighted that hasn't been established. Obviously, people are seeing something," Bartholomew said. The Whitehall resident rallied to get legislation passed by the Whitehall Village Board in 2004 to protect the creatures. "I thought it worked on multiple levels. It establishes the history of the creature, and it could put the phenomenon in a positive light, so witnesses won't be afraid to come forward," he said. Bartholomew's brother and co-author, Robert, still wants scientific proof of the creatures' existence. "My brother Paul is convinced the creature exists," Robert Bartholomew, a sociologist currently working with Aborigines in Australia, wrote in an e-mail. "I, on the other hand while acknowledging that there is compelling evidence, as a scientist, require physical evidence in the form of a body, fossils or bones. Nothing less will suffice." Paul Bartholomew is hopeful that his years of research will be validated with conclusive evidence. If that happens, lore will become history. "I think the case sort of presents itself," he said.